St. Petersburg museums, big and small, open their doors to visitors in the evening and remain open late into the night, as well as prepare a special program: one-day exhibitions, concerts, performances, author tours, workshops, historical reconstructions. Museum Night is an international event that takes place annually in 42 European countries. Nearly 2,000 museums “do not sleep” once a year, opening their doors to all who are interested to see a museum in an unusual time of the day. 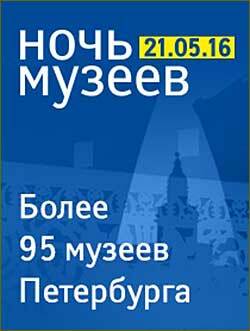 In 2016 Museum Night in St. Petersburg lasts from 6 p.m. on 21 May till 6 a.m. on 22 May. Some museums have prepared an evening program (from 6 p.m. till 11 p.m.) for those who want to go to bed earlier. Night program museums (open from 6 p.m. till 6 a.m.) invite those who are ready for a long night walk in St. Petersburg. Museum Night in St. Petersburg this year is dedicated to the theme "The Very First". The museums will tell you about records and record holders, the earliest artifacts and people who were pioneers in their fields; and would also suggest visitors do something for the first time in their life and thus also become the very first in something. City news archive for 18 May' 2016.